Review: So right off the bat we have two pretty good characters Kyra and Tristam. Kyra is a thief one of the best that anyone has ever seen and due to certain circumstances she winds up being part of the Assassins Guild run by James who we met in Poison Dance the prequel. Then there is Tristam who is a Knight and he ends up losing a very close friend of his to the Demon Riders and due to that is set out to get revenge and justice for his friend. It took me a minute to get into the book about the thirty percent mark to be exact until then I was slightly bored but once things got going I couldn't put the book down. 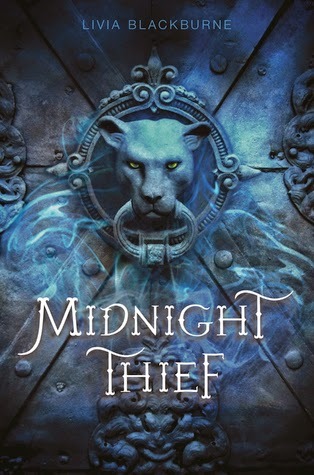 What I liked the most about Midnight Thief was the dual point of views, I feel like I get to know both the main characters that much better and honestly if it wasn't for the dual pov and if we saw everything from Kyra's perspective I probably wouldn't have liked Tristam as much it was his inner thoughts and struggle that made him a bit more interesting. There was also a little bit of romance brewing between Tristam and Kyra which honestly I didn't care much for it was pretty blah although I'm hoping things will heat up more between the two in the next book. Also we get more of James obviously with him being the guild leader but what kind of put me off was that when we met him in Poison Dance he was such a different person and in Midnight Thief he is this wicked heartless man who doesn't care who he hurts including children and it just didn't make sense. I'm wondering what happened to him to make him change so much. I mean I really hated the man in this book while I loved him in the prequel. Midnight Thief has a lot of twists and turns and Kyra ends up surprising everyone including herself when we learn about who she really is, personally I never saw it coming. I only wish that the history of her kind was explored more I mean to me she is still a big mystery one that I can't wait to be solved. I also really found myself rooting for Kyra it seemed like everyone was trying to use her for their own purposes. Overall this was a good start to a new series and even though things wrapped up at the end without some insane cliffhanger I still am curious about quite a few things and I am finding myself wanting to know what is going to happen next with Kyra and even Tristam. Memorable Quotes: ~ " That's the problem. You're avoiding trouble from them, but they should be the ones afraid of you." ~"You're losing yourself, Kyra. Is it worth it?"